Western Hemlock (Tsuga heterophylla) is a fast-growing, evergreen tree. A native tree of North Ameria, this is a very adaptable tree, it grows well on a range of soil types, except chalk. As a specimen tree, it has a graceful habit, with attractive , spreading branches and a spire type form. Expect a final height of 45m (150ft). Typically, Western Hemlock may be planted as an individual tree or as an avenue of trees. Estate and Policy Woodland plantings from the 18th Century often found this tree planted along with other North American conifer species. Today, 150 years later these trees form an amazing sight and we think that this tree worthy of planting to achieve the same effect for future generations. Western Hemlock plants were available. Prices were clearly stated. 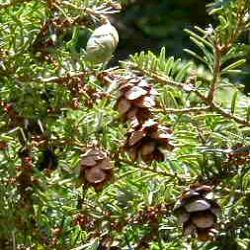 Questions regarding the Western Hemlock were anticipated and answers listed on the page. Also on the plus side, the words were not in tiny organic green overflowing the screen on pale organic buff background. I could read your page with ease , Click click click and they were ordered and had it not been for googlechrome butting in that would have been that. You offered to take payment by phone - something the friendly but useless bunch up there did not even offer. My resident geek banished googlechrome and click click click they were ordered and paid for. They came nicely packed and on the day promised. What more could I ask? It is unlikely I will be planting another hedge and I might not even see this one reaching maturity so it is doubtful if I will be darkening your doorstep again but rest assured I would have no hesitation recommending your service to anyone who asks.Robert Bain.